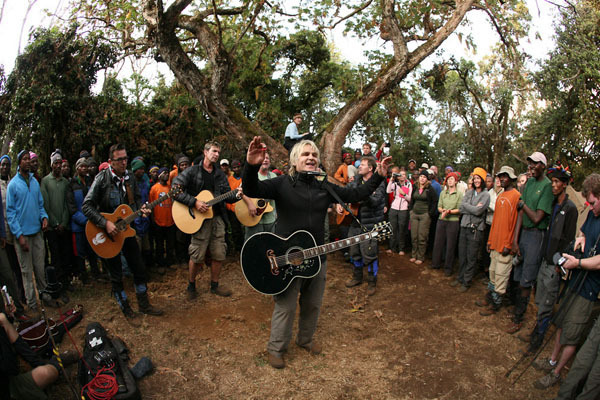 Alarm frontman Mike Peters has never been one to think small. This is, after all, a musician whose first major hit was called “68 Guns.” The official legend of the cancer research foundation Love Hope Strength, which Peters co-founded, goes that when Peters was receiving cancer treatment in Wales, he would always look out of his hospital window and see a mountaintop. He told his doctors that when he had recovered, he would perform on that mountaintop to raise money for cancer research. Peters later founded Love Hope Strength in 2007 with Texas-based live music promoter James Chippendale. Since then, the foundation has organized a number of ambitious events, including treks to Machu Picchu, Kilimanjaro and Mount Fuji that featured musicians like G. Love and Donavan Frankenreiter hiking up some of the world’s tallest mountains alongside cancer survivors and supporters, and then performing for the volunteers. “Some people love music, and some people love adventure and a challenge, and we’ve all these passions and put them all in to one crazy foundation,” Shannon Foley Henn, Executive Director of Love Hope Strength, tells Music for Good. Love Hope Strength has helped raise money to fund a mobile cancer unit in Peru and purchased the first mammogram and radiation machines for Nepal. The foundation tends to think big, but its directors realize that not everyone can take a few weeks off to travel across the world. Which is why their upcoming event Colorado Rocks will take place at the more accessible location of Vail Mountain on the weekend of July 14. G. Love, Brett Dennen, Cy Curnin of The Fixx and Miles Zuniga of Fastball and young musicians from the School of Rock will hike alongside fans and then perform an acoustic show. There’s still time to register to participate. There will also be an 18-day Everest Rocks II event in Nepal starting on November 25. But if you can’t make it to the mountain this year, Love Hope Strength will bring the mountain to you, so to speak. In addition to the Colorado and Nepal events, the foundation is organizing the Get On The List campaign, which will allow concertgoers at this summer’s Lollapalooza to register with the national bone marrow database DKMS. The Get On The List campaign will also be present at upcoming Jack White, Norah Jones, B-52s and Foster The People tour stops, amongst others. For more information about Love Hope Strength, and to find out how to participate in upcoming events, go here.